Last Day at Lake Mohonk . . .
Mahmud writes: "Photographs of `Abdu'l-Bahá were taken together with His party. [You will see one to the right, from the holdings of the Peace Collection, Swarthmore College. I have paid for use of this image; it should not be used without permission.] Many dignitaries visited Him and were attracted and ignited by His love. He then expressed His intention to return to New York. The president of the conference [Albert K. Smiley] was reluctant for Him to leave. The Master replied, `As I have to see numerous people and speak to many audiences, I must leave.' The president remained in the presence of the Master with great reverence until He left. The Beloved presented the president with a good quality Persian carpet, for which he was very thankful." Can you imagine being Dr. Bagdadi, determined to do the bidding of `Abdu'l-Bahá, yet thwarted by circumstances, and then finding a way? Or being the mail carrier who gave him a ride and hearing about the purpose for this carpet? We are standing with a cut-out figure of Albert Smiley! `Abdu'l-Bahá did have a way of getting what He needed--and a way of knowing what others "needed"! It must have been hard to leave that place of beauty, where peace was the focus. Mahmud writes: "When the Master returned to New York, the friends came to see Him. They were delighted to hear that so many at the conference were attracted and paid attention to the Master's address. A few days later the talks He had given at the conference were published in a New York newspaper and thus provided guidance to many." Published by the Lake Mohonk Conference on International Arbitration, 1912 (Press of the Brandow Printing Company, Albany, N. Y. ); 242 pages. See ‘Abdu’l-Bahá in New York : Centenary of His Visit to America, by Hussein Ahdieh and Hillary Chapman, pp. 42-45, for details about ‘Abdu’l-Baha’s journey to Lake Mohonk and the reception he received there. The Chairman: I am sure we are all glad to cordially welcome as the first speaker this evening Abdul Baha Abbas, of Persia, the well-known leader of the Bahai movement. When we consider history, we find that civilization is progressing, but in this century its progress cannot be compared with that of past centuries. This is the century of light and of bounty. In the past, the unity of patriotism, the unity of nations and religions was established; but in this century, the oneness of the world of humanity is established; hence this century is greater than the past. Sixty years ago Asia was in great turmoil of wars ; England, Russia, Turkey and France went to war. There were wars in Persia, wars among the religions and wars between nations, especially in Persia on account of the existence of the different nationalities, such as Turks, Persians, Arabs and Kurds, and the various religions, namely, Mohammedan, Jewish, Christian and Zoroastrian. Among these different religions the greatest enmity and rancor were extant. At such a time as this. His Holiness, Baha'o'llah appeared. He proclaimed the oneness of the world of humanity and the greatest peace. He wrote to all the kings and addressed epistles to all the religionists of Persia, and all the souls who accepted his platform and emulated and followed his teachings — whether Christians, Mohammedans, Jews or Zoroastrians — were united and attained the greatest amity and unity. Through those teachings, the Kurd, the Arab, the Persian and Turk freed themselves from the prejudice of race and were people agreed to an extent which is indescribable, indeed, in such a manner, that were you to enter their meeting you could not distinguish between the Persian, the Christian, the Arab or the Turk, and you would not observe any differences of religious opinion. Among those people the utmost of love and oneness of peace now obtain, for the great teachings of Baha'o'llah make for the oneness of the world and for humanity, universal peace and arbitration. The following are a few of the principles of Baha'o'llah. First, that all must investigate reality. It is incumbent on all nations to investigate truth. For Baha'o'llah declares that the foundations of the divine religion are one and that one is reality and reality is not multiple but indivisible. But the imitations which have come in, being different in character, have caused divisions and separations. If we forsake the imitations and revert to the original foundations of the divine religion, we shall find that the foundations are that reality which is one and not multiple. The second principle of Baha'o'llah is the oneness of human kind. All humanity belongs to one family, inhabiting the same globe; all are beneath the providence of God; God has created all and has nurtured all and provideth for all and preserveth all. This is the policy of God. God is kind to all and why should we be unkind? Is there any policy wiser and better than God's policy? No matter how keen the human mind may be, it cannot surpass the policy of God. The policy of God is perfect and we must follow it and not our own self-interest. The third teaching of Baha'o'llah is that religion and science are twins. If a religious question be not in accordance with science, it is imagination. All religious matter must correspond with science, every question which meets the criterion of science shall be acceptable, and those questions which do not come to the standard of science are not to be given credence. The fourth teaching of Baha'o'Uah is that religion should be the one bond which shall unite society, which shall cement together the various peoples, which shall cause a unity among all the creeds. If religion should be productive of strife and division, if it should cause bloodshed and war and rapine, irreligion is preferable to religion. Religion was meant to be a bond of love among mankind. The fifth principle is that racial bias, religious prejudice, patriotic prejudice, political prejudice, are the destroyers of the very foundations of the body politic. All humanity is one in kind, the surface of the earth one home, and the foundations of the divine religions one. All the wars which have taken place since the inception of human history have emanated either from religious prejudice, racial prejudice, patriotic bias or political greed and interest. As long as these prejudices last, so long will the foundations of humanity tremble. When such prejudices pass away the world will at last find peace. The sixth principle of Baha'o'llah is equality between mankind and womankind. Woman and man are both human and both the manifestations of God's grace. God has created man and has endowed him with knowledge and intelligence. The difference which now exists between man and woman is only a difference of education, and when woman shall receive the same education no doubt her equality with man shall become a reality. The world of humanity is composed of two organizations — the male and the female. If one organ be defective, that defect will affect the other. Until perfect strength shall obtain in both, and woman shall attain equality with man, the happiness of humanity will not be insured. comforts according to their respective deserts. * Nicholas Murray Butler, President of Columbia University is mentioned by Shoghi Effendi in God Passes By (p. 388). Met Abdu’l-Baha at Lake Mohonk*. 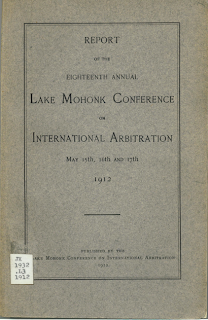 *The Eighteenth Annual Lake Mohonk Conference on International Arbitration – 15 – 17 May, 1912 held at Mohonk Lake, New York. Found it! Dr. Castrillo was the SPEAKER that followed 'Abdu'l-Baha during the 2nd session in the evening. What a find! Thanks to historian Payam Afsharian of the L.A. Baha'i Center in Los Angeles for this lead.